Gary Habermas, "Greg Bahnsen, John Warwick Montgomery, and Evidential Apologetics. 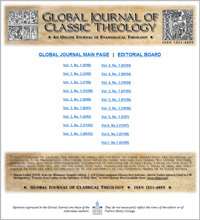 Global Journal of Classic Theology, 3:1 (2002): 240-242. The subject of apologetics has long interested certain Christians, especially those desirous of sharing their faith or building the confidence and assurance of believers. Other times it may simply be necessary to defend Christian theism against attacks and challenges. In this essay, I will address several internal issues regarding apologetic methodology. I will begin by briefly introducing some of the classic disputes between evidentialists and presuppositionalists that took place during the last third of the Twentieth Century. Then I will propose a number of rejoinders to the late Greg Bahnsen's presuppositionalist critique of evidentialist John Warwick Montgomery's system. At the close of the Twentieth Century, however, the discussions have proceeded in new directions. As is so often the case in ongoing dialogues, additional issues have taken center stage, while some of the older ones have receded into the background. Perhaps foremost among the new trends is that the discussions have been significantly less pointed in recent years. Even more importantly, the two sides (as well as other positions) have unquestionably moved closer together, finding some significant agreement on several issues that used to be more divisive. Steve Cowan concludes that there is "a growing consensus that the various apologetic methods are not as polarized as they once seemed . . . . apologetic methodologists of various schools have been willing to concede views that they once would have opposed." Still, we must add quickly that there are many important issues yet to resolve. For example, questions concerning the central apologetic strategy of any methodology would certainly be significant. So when the late Greg Bahnsen, one of presuppositionalism's ablest defenders, challenged a number of John Warwick Montgomery's principal pillars, it is not surprising that some of his criticisms also question evidentialism in general. So even though it was written just after the zenith of these earlier debates, Bahnsen's essay raises a number of significant issues that still need to be addressed today. The exceptional length of Bahnsen's treatment, however, makes it closer to the size of a small book than an essay. This factor absolutely requires that I only respond to a few key issues, in order to stay within the length of a journal article. With this in mind, my twofold approach in the present critique will be both to address several of Bahnsen's claims against evidentialism, as well as to challenge a few key issues regarding his own resulting apologetic system. In at least three important areas, Bahnsen takes great exception to Montgomery's entire apologetic approach. (1) He strenuously objects to what he considers to be Montgomery's reliance upon a long outdated positivistic methodology. Time and again, Bahnsen mentions Montgomery's appeal to data that can be neutrally observed by anyone who cares to study it, brute facts that are inseparable from their meanings, and the claimed objectivity of our knowledge. These and related terms are constantly appended as adjectives almost in a taunting fashion whenever Montgomery's views are discussed. Bahnsen repeatedly attacks each of these aspects from the perspective of Scripture and contemporary epistemology, with some reference to philosophy of science. (2) Further, Bahnsen questions Montgomery's reliance on probabilistic argumentation, denouncing such an approach as philosophically misguided, apologetically unworkable, and unbiblical. Throughout, Bahnsen finds that Montgomery's appeal to this concept is completely misplaced. (3) Bahnsen also attacks Montgomery's outworking into a tiered evidential argument from the trustworthiness of the New Testament to the historicity of Jesus' resurrection to Christian theism. Bahnsen charges that each of Montgomery's premises is defective and that his conclusion does not follow. So the often contradictory interpretations of facts must be taken, in the sense of the creative intermix between induction and deduction that Piercean abduction or "inference to the best explanation" typifies, to the facts themselves. The theoretical virtue in view here, as Ramsey tells us, is "empirical fit." Montgomery is fully aware that the human subject of experience has proclivities, presuppositions, hopes, fears, and a long list of dreams and apprehensions that can, in some measure, affect even one's perceptions to a significant, and sometimes even telling, extent. The "empirical fit" virtue of scientific theories, however, is then translated--and this is the glory of Montgomery's insight, and perhaps his key insight--into the "empirical fit" of the various interpretations (shoes) about Jesus of Nazareth, which is tested against the facts concerning his person, work, sinlessness, miracles, and resurrection. Only a divine Christ properly fits the historical data concerning Him. I think that Bahnsen missed this vital distinction about Montgomery's use of abduction, but with reason: Montgomery could have done a better job integrating his presentation of the craft of theological theorizing into his views of Scripture, the testing of sets of historical facts, the weighing of apologetic theories, and in related areas. All too often, Montgomery provides excellent pointers, but avoids giving a detailed defense, as with the resurrection of Jesus. But is it the case that Montgomery subscribes to the older, positivistic schema? More importantly, does he do so in precisely the way that Bahnsen charges? I think not. It is true that Montgomery regularly emphasizes the objective aspect of historical facts, perhaps too much in light of the subjective element that we just mentioned. But to say that Montgomery is unaware that biases like those we have mentioned always affect the writing of history, or that such prejudice is always present, or that he disallows the influence of these subjective factors, seems to ignore the presence of several decisive comments. For example, although he appreciates the "rigorous standards for historical investigations," Montgomery specifically critiques positivism as follows: "the attempt to turn history into a science on a par with physics or chemistry was doomed to failure. . . . The Positivists made the mistake of believing that historical studies could attain the same degree of objectivity as scientific studies . . . ." A key reason why such objectivism fails, Montgomery points out, is that our "philosophies of life have always, and will always, produce different interpretations of history. The Positivists did not recognize this, and spoke as if one could enter on historical work with complete objectivity." He also objects to the positivistic insistence on reducing history to objective laws when humans are "unique, free, and gloriously unpredictable." Moreover, in a chapter on historiography, Montgomery notes several problems with constructing a philosophy of history. The first of these is the part played by human nature, which "is always present at the outset of an investigation . . . prior to engaging in any specific investigation." These standards come from the historian's "general philosophy of life." The historian's view of reality, then, can make one "incapable of adequately interpreting" events. So Montgomery makes it clear that subjective and other elements can certainly skew one's study of historical events. He makes this point a number of times, especially regarding the unbeliever's ability to discern the nature of reality. If, for instance, a researcher is convinced that human nature is not sinful, his "historical study will suffer in the gravest possible degree." It seems to me that many of Montgomery's comments on this subject would make a presuppositionalist proud, indeed! A fair interpretation, then, would be to understand Montgomery's references to objective facts, especially the many times where he simply utilizes these or similar terms without much explication, in light of his clearer explanations. Undeniably, Montgomery's statements have drawn an outcry. But he has also been clear that the terms in question should definitely not be equated with the way that positivists have used them. I will simply mention another relevant issue here. It will be pointed out below that presuppositionalism is not a monolithic position. One often gets the impression from some presuppositionalists that simply admitting that there are no neutral viewpoints is sufficient to make one a presuppositionalist of the Van Til-Bahnsen variety. But this is totally mistaken. Virtually all commentators today freely admit the import of one's predispositions, or similar perspectives. But we will see that it does not follow from this that such is all that is required to make one a presuppositionalist of this variety. But if Bahnsen's chief concern is the application of probability to matters of faith, Montgomery could point out that historians qua historians are limited to the use of their own tools in the process of uncovering the past. In other words, if we ask an historical question, the certainty of the answer cannot proceed beyond the inductive nature of the historical enterprise itself. Although perhaps an overstatement, J. Oliver Buswell even goes as far as to say, "There is no argument known to us which, as an argument, leads to more than a probable (highly probable) conclusion." But, the apologist could continue, this is not the entire picture. In addition to the probabilities supplied by historical and other inductive arguments, there is also the ministry of the Holy Spirit, Who, as J. Oliver Buswell notes, provides "far more" than probabilities, as He convicts, regenerates, and energizes persons. The work of the Holy Spirit might come in the form of moving beyond the lack of "absolute certainty in terms of historical method," closing the gap and bringing "absolute certainty." Or it might be more a case of taking the historical facts and applying a personal faith decision. Thus, on the Christian understanding, historiography as a discipline can only yield some level of probability, since this is simply its limits. But believers need not rely on this basis alone. Of course, Bahnsen is certainly correct that the New Testament speaks of events such as Jesus' resurrection as having occurred, not as probably having occurred. But, then again, the New Testament also tells us that the Holy Spirit convicts believers of their salvation, thereby witnessing to the truth of the Gospel message. So there is certainly more to the story than history alone! Interestingly, in the recent volume on apologetic methodology referred to above, all five writers, including the two evidentialists, subscribed to the view that the Holy Spirit provides such knowledge and certain assurance to the believer. Very helpfully, Craig differentiates between "knowing" and "showing" Christianity to be true. Knowledge of the truth of Christian theism is due to the work of the Holy Spirit's witness in the believer's life. But showing Christianity to be true has to do with the presenting of evidences, some of which, like historical arguments, are probabilistic. On this sort of approach, Bahnsen ought not object that other apologists are unbiblical in using probability arguments in spite of Scripture's proclamation that historical events really occurred. One response to Bahnsen, as we have said, is that his critique of probabilistic research does not allow that this is as much as the discipline of history can yield. Further, direct assurance may be provided by the Holy Spirit, proceeding beyond what history can contribute. I think recent apologists are quite well agreed that the witness of the Holy Spirit provides believers with such absolute assurance. (3) I will not respond in detail to whether Montgomery really succeeds in his six-premise apologetic argument from Scripture to Jesus' resurrection to the truth of Christian theism. After all, I am unaware of a single, extended defense of this approach by Montgomery. So perhaps it was never his purpose to do anything but state the argument, along with defending it against some initial objections. To my knowledge, Montgomery never develops his argument beyond these contexts, and certainly not in a lengthy treatise. So for Bahnsen to address and examine it as a developed case is, I think, to miss the point. Further, even if Bahnsen thinks that Montgomery's inductive argument is less than compelling, the worst that can be said is that we need additional or better data (assuming that such exists). So the chief issue here is whether there is such evidence, not whether Montgomery presents it in detail. As I said, his treatment suggests that such was not even his purpose. The principle I am suggesting here is well known in logic, and is called the principle of charity. Namely, we ought to strengthen our opponent's argument so that we are responding to its strongest form. The principal idea here is plain--if an argument can simply be patched up or arranged differently, then the critique may fail on that grounds alone. I am suggesting that Bahnsen should have addressed the argument as if the appropriate details had been included. In sum, we have considered briefly three of the chief areas where Bahnsen critiques Montgomery (namely, the claimed use of positivistic methodology, probability, and his six-step evidential argument). In all three instances, Montgomery can reassert his positions. Perhaps some clarification is needed, as in pinpointing in even more detail how he has already allowed for the presence of subjective factors in historiography. Or Montgomery might present a further treatment of the work of the Holy Spirit specifically regarding apologetics. Some of his other arguments could also be further evidenced, although Montgomery could simply say that it was not his purpose to develop a case in any great detail, referring to texts where similar points have long been made. But I do not think that Bahnsen's critique dismantles Montgomery's overall approach, much less the evidentialist apologetic method as a whole. One major concern that clearly emerges from reading published works from the Van Tillian presuppositional school of thought is that they seldom even attempt to develop positive evidences for Christian theism. A simply amazing phenomena here is that, while they clearly acknowledge the need to do so, they very rarely ever attempt it. For example, Van Til acknowledges that he thinks it is important to "engage in historical apologetics." But he explains that he does not do so because his colleagues in his seminary "are doing it better than I could do it." Still, he adds a few suggestions on how such an effort should be done. Now what is wrong with such a response? Is not modesty a laudable asset? The oddity of the matter, however, is when Van Til's key pupils, such as Bahnsen and Frame, say exactly the same thing. The end result is that the three main proponents of this brand of presuppositionalism have all commended positive evidences, but backed away from actually producing them. The similarities of the responses may be surprising. For example, Bahnsen acknowledges Van Til's approval of historical evidences, listing some of Van Til's caveats about doing so. Likewise, Bahnsen himself endorses historical evidences. But to my knowledge, Bahnsen never develops a case himself, either in his lengthy response to Montgomery, or elsewhere. Frame is even more straightforward. He recognizes that the Bible frequently makes use of historical evidences, holding that they are crucial in arguing a case for Christian theism. He even states: "I am happy to salute the evidentialist tradition," complimenting many authors, including Montgomery, Craig, J.P. Moreland, and myself for developing various sorts of evidential arguments. Yet, Frame admits that presuppositionalists have failed by not producing evidences for Christianity. He even goes as far as to say, "Unfortunately, there has been very little actual analysis of evidence in the Van Tillian presuppositionalist school of apologetics." Then he adds, "I hope this gap in the Reformed apologetic literature will soon be filled, though I cannot fill it, at least not here and now." Elsewhere he speaks similarly, acknowledging this tendency as a weakness in presuppositionalism, but again noting that he is not the one to do anything about it. And while discussing historical evidence for the resurrection of Jesus, Frame starts out by saying, "I shall not add much to the voluminous literature showing the credibility of the biblical witness to this great event." Why, it may be asked, could not these presuppositionalists simply make the same move that I suggested that Montgomery might take? Namely, why do not these scholars also have the option of saying that it was simply not their purpose to present historical evidence in great detail? The difference should be clear. We just saw that even presuppositionalists like Frame admit that he recommends the works of evidentialists who have developed strong historical arguments for Christian theism. However, such is clearly not the case with Van Tillian presuppositionalists, as Frame himself realizes. So the issue here is not only whether a particular scholar--say Montgomery or Bahnsen--develops such a case in detail. The problem is that such arguments are the very mainstay of the school of evidentialist apologetics as a whole, while Frame asserts that there is a "gap" in the Van Tillian camp here. So the latter cannot defer to other members of their group to do a more complete job of historical apologetics, precisely since none apparently exist! So presuppositionalists may simply retort that since evidentialists have already produced the necessary historical works, there is no more need to do so. But even this would seem to miss the mark for at least three reasons. (1) Presuppositionalists, like evidentialists, clearly pursue defensive apologetic efforts to answer Christianity's critics, with both groups producing many exemplary instances. Accordingly, why should the publication of many positive cases by evidentialists alleviate the need for presuppositionalists to produce positive arguments from their own perspectives? In other words, since presuppositionalists regularly originate their own defensive moves, they should produce the evidential (offensive) side, as well, especially since they both have conceded the need to do so, plus they apparently have particular concerns that are seldom dealt with by evidentialists. (3) If Van Tillians constantly need to "borrow" the evidentialist research here, they open themselves to another, much more serious critique--it would then appear that their apologetic method is incomplete, offering only part of the picture. Thus, if a positive apologetic is both crucial and biblical, to produce only defensive critiques of other systems without establishing one's own is a serious omission. And if such a positive apologetic virtually never appears, then in what sense is Van Tillian presuppositionalism a complete apologetic system? At any rate, what we observe is that at least some Van Tillian presuppositionalists, of whom Bahnsen is perhaps the best example, continually want to tell evidentialists and other apologists how they ought not do historical evidences, countering that it should be done in a very specific manner. But, they almost never produce the details themselves! So we return to our original question. Why is there such a broad gap here in the Van Tillian camp? George Mavrodes, who has influenced Frame, takes the next step and asks why Reformed thinkers as a whole so frequently devalue positive evidences? He answers his own inquiry: "Maybe it represents a deep ambivalence in Reformed thought, a tendency to oscillate . . . ."
Or perhaps this lack is due to philosophical commitments. For instance, Bahnsen's seeming philosophical and/or religious skepticism, at least at points, might help us to understand why neither he nor other prominent presuppositionalists ever try to establish a major, positive case for Christianity. Examples of Bahnsen's skepticism are not too difficult to produce. For example, in order to challenge Montgomery and/or to avoid the thrust of the latter's arguments, Bahnsen makes many (sometimes rather unnerving) points on behalf of the non-believer's possible responses. Thus, there are continual references to unbelievers having even better arguments than Montgomery's or unbelievers not needing to be convinced by the evidence Montgomery produces. Specific instances include the improbability of Christ rising from the dead when argued according to Montgomery's probabilistic standards, or even Bahnsen's defense of naturalistic theories against Jesus' resurrection, done in the name of critiquing Montgomery! I have to remark that these last stances, in particular, are exceptionally objectionable, especially from one who complains regularly that we need apologetic approaches that are more biblical! Further, Bahnsen questions whether we can know Jesus' world view, or even what kind of God ensues from Montgomery's arguments. Bahnsen insists that "the resurrection of Jesus does not infer His deity and His deity does not infer His truthfulness." Now I wish to be quick to point out here that no one who knew Greg Bahnsen would ever question his commitment to God, or ever suggest that he believed any of these counter arguments. We must also promptly assert that Bahnsen was proposing these unbelieving alternatives, not because he thought that they had any chance of being true, but because he wanted to point out how Montgomery's approach championed "an alien epistemology." Thus, Bahnsen thought that, by Montgomery's standards, we end up with an unbiblical scenario. But as much as I appreciate Bahnsen's zeal, I think his approach as exhibited in these sorts of challenges to Montgomery are very wide of the mark, for at least three reasons. (1) Bahnsen almost gives the impression that he is more interested in winning a debate with Montgomery than winning hearts. Why would he ever, under any circumstance, want to provide some "leads" for unbelievers concerning how they might argue in order to preserve their unbelief? Although his chief point was to argue against what he thought was the unbiblical nature of Montgomery's evidentialist methodology, what price is Bahnsen willing to pay? I will not pursue this further, except to say that, in my opinion, raising objections on behalf of the unbeliever to the historicity of Jesus' resurrection, Jesus' view of God, His deity, or the truthfulness of Jesus' message is definitely not the way to argue against a fellow evangelical, even if we object to their methods! The response almost seems to be one of burning the message along with the messenger! Since evidentialist attempts to show that Jesus rose from the dead do not seem to please Bahnsen very much, at least as argued by Montgomery, I want to know how Bahnsen is going to respond to the exact same issues? Further, how is he going to refute the same naturalistic theories that he raises? Is he going to cite historical facts? How, if not the way an evidentialist does? Surely, he will not simply state that the unbelievers are wrong because the New Testament says so and leave it there? I agree that Scripture states that unbelievers are absolutely wrong, as well as lost, but on what factual grounds are the unbeliever's naturalistic theories mistaken? Bahnsen needs to be reminded that just because he has raised questions, this does not mean that he has refuted Montgomery's argument! As we have just seen, attempting to build a positive argument is much tougher than simply asking questions. (3) This brings us to perhaps the key issue that Bahnsen wants to discuss. What about the biblical teaching on this subject? Does the New Testament ever argue in a manner close to that presented by Montgomery? Does Scripture present a case that utilizes evidential-type considerations? Unquestionably, Bahnsen thinks that Montgomery's approach is unbiblical. But I think that Bahnsen has gone to such great extents to argue his points that he fails to come to grips with numerous biblical passages which he is forced to either ignore or to provide less than likely interpretations. This is troubling enough that I have devoted the next section to the issue. I have said in this section that presuppositionalists of the Van Tillian persuasion are quite clear that historical evidences are biblical, important, and ought to be pursued. Yet, one finds perhaps not a single, detailed example where their best-known representatives take their own challenge. They provide many suggestions, assertions, and outright dismissals of the work of others (like Bahnsen's critique of Montgomery), but virtually no detailed examples of their own historical spadework has been forthcoming. I have suggested that their biblical, theological, and/or philosophical commitments might militate against their own efforts here. Bahnsen's seeming philosophical and religious skepticism serves as a detailed example. As a result, I made the further suggestion that these commitments likewise dismiss certain Scripture texts that express positions unlike their own. Bahnsen castigates Montgomery's apologetic use of Scripture. But in the process, Bahnsen struggles with the clear meaning of several texts, both ones he specifically mentions, as well as some others. For the sake of brevity, I will largely limit this discussion to passages regarding Jesus' resurrection, as Bahnsen does himself. Further, we must necessarily be very selective in our treatment here, which is nothing more than a cursory look at a few texts. Bahnsen charges that "in fact there is no Scriptural evidence at all that the apostles or anybody else urged the people to go prove the resurrection by inductive research." While such a careful choice of words may perhaps be accurate in some sense, strictly speaking, it does not do justice to the plain meaning of several New Testament texts. And Bahnsen especially strains to make sense of those passages where Jesus clearly presented sensory evidence that He had risen from the dead. For example, Bahnsen states that the best example of resurrection faith is not the case of doubting Thomas, but Abraham, who believed "[a]gainst all empirical probability or inductive reasoning." Five items need to be briefly mentioned. (1) Even if Abraham is the believer's chief example of faith in Scripture, it is a bit anachronistic to call this Old Testament saint our "example of resurrection faith." Regardless, to say that Abraham's believed "[a]gainst all probability or inductive reasoning" is to rather badly miss some key texts. On many occasions, God specifically spoke to Abram (cf. Gen. 12:1-3; 13:14-17; 22:1-2). Although we are not told the exact sense in which this occurred, these were clearly personal and meaningful communications. In another instance, precisely because Abram asked God for assurance of His promises, he was directly given a sign that God would do all that He had promised (Gen. 15:8-21). Later, God and two angels even visited Abraham and the latter spoke directly with them (Gen. 18:1-33). Abraham also witnessed God's very visible, physical, and supernatural judgment on Sodom and Gomorrah (Gen. 19:1-29). On still another occasion, an angel spoke to him twice (Gen. 22:11-18). Even this brief survey shows that it is hardly accurate for Bahnsen to say that Abraham's faith was established apart from and even "against" any data obtained from his sense experiences. Rather, Abraham's faith was clearly augmented at many points by direct, even miraculous, contact with God. This also means that Abraham was the recipient of many inductively-derived data. Even in his case, then, his faith was not produced in a vacuum! (2) Still, citing Abraham does not justify virtually ignoring the significant account of doubting Thomas' faith being generated by Jesus' resurrection appearance (Jn. 20:24-28). Even though Jesus told Thomas that it would have been better if he had believed without requiring the appearance (20:29), it still remains that Jesus chose to appear to Thomas after the disciple said that he would not believe without empirical justification for doing so. It is also significant that this appearance led directly to the apostle's faith. (3) Further, the appearance to Thomas was not an isolated incident. The resurrected Jesus also showed Himself on other occasions, evidencing His bodily resurrection from the dead in more than one way. In these contexts, Jesus did not indicate any problem or hesitation in allowing (and even suggesting) physical contact and other sense data regarding His resurrected body. This included being seen by the women, who held His feet (Matt. 28:9), seemingly similar to Mary Magdalene holding on to Him after her return trip to the empty tomb (Jn. 20:17). Jesus also showed His body and its scars to His disciples in order to calm their doubts, even eating in front of them as a further indication of His actual, time-space presence (Lk. 24:36-43; cf. Jn. 20:19-20). Just a very few years after the Gospel of John was written, Ignatius affirms that, on this occasion, the disciples both touched Jesus' body and believed in Him (Smyrnaeans 1:9-12). (4) Paul tells us that Jesus appeared to a group of at least 500 persons at once, which also carries some strong apologetic implications, especially since we are told that most of these witnesses were still alive. Responding to Montgomery's statement that the intent of Paul's report was to affirm that these witnesses could still be interviewed, Bahnsen scoffs, asserting that Paul made this statement to believers, who presumably would not need such assurance. But Bahnsen misses the point here, and by a large margin. For starters, he both overlooks and underestimates the texts just listed above that express much doubt and lack of recognition on the same subject regarding the resurrected Jesus, even by the disciples themselves. After all, the resurrection of an individual before the end of the age was contrary to Jewish expectations (Jn. 11:23-24), besides the incredible nature of a dead man returning to life, which makes questions quite understandable! Further, throughout Scripture, believers regularly express even severe doubts on other matters, making strong charges and requesting assurance or other answers. To miss the fact that believers also suffer doubts and need assurance is a grave miscalculation. Further, the majority of commentators acknowledge that Montgomery's position is clearly correct--Paul's point was precisely that many of the eyewitnesses to the resurrected Jesus could still be checked out. (5) Bahnsen closes his essay by paraphrasing (in terms of his own methodology) Jesus' teaching that "if men will not hear Moses and the prophets neither will they believe the most compelling, factual demonstration!" But even here, he fails to make his contextual point against the use of empirical evidence. Jesus obviously did not mean that His statement in Luke 16:31 should be taken without exception--that an empirical, "factual demonstration" should never be used and will never lead anyone to saving faith. If so, He never would have appeared after His own resurrection to the women and disciples, repeatedly using empirical evidence to answer their questions and to reassure them, even bringing at least Thomas to faith. But we also have additional demonstrations of the incorrectness of Bahnsen's position, provided by the cases of Paul and James, the brother of Jesus. Both of these apostles were also converted from their previous positions of skepticism and unbelief by resurrection appearances of the risen Lord Jesus (1 Cor. 15:7-8). Once again, we have two more examples of the biblical use of sense data to induce belief or assurance. These are the sorts of reasons why evidentialists do not shy away from using the historical evidence for Jesus' resurrection! On an often-repeated, somewhat related charge by Bahnsen, why is it relevant that most unbelievers will fail to be convinced by Montgomery's apologetic approach? Even in the Gospels, do not unbelievers regularly walk away in unbelief from Jesus Himself? And when Paul debated the philosophers in Athens, why did only a few become believers (Acts 17:32-34)? Further, what about those unbelievers who heard or debated Bahnsen--like atheist Gordon Stein? Did they become believers? But this brings up an additional problem for Bahnsen regarding his understanding of Luke 16:31. That anyone came to Christ after a debate or dialogue concerning Jesus' resurrection seems to be counter to Bahnsen's approach, especially when the same author (Luke) explains that, rather than being atypical instances, apologetic approaches featuring the resurrection were Paul's customary method of presenting the Gospel message. We could go on and on here. But I will very briefly mention just one other sort of evidential consideration from Scripture. We often get the impression from Van Tillian presuppositionalists that Scripture should stand on its own, and should not be tested or judged, as in compiling evidences to show that Scripture is trustworthy or inspired. However, throughout the biblical text, believers are constantly told to test God's revelation by means of various checks and balances in order to see that it is truthful. For example, we are told to examine potential prophets to ascertain if their words really do come from God (Deut. 18:21-22). God passed the test of fulfilled prophecy (Isa. 41:25-29; 42:9; 44:24-28; 46:10; 48:5, 14). God proposes that other "gods" be tested similarly (Isa. 41:21-24; 44:7). God even called on Israel to be a witness to His mighty historical confirmations (Isa. 44:6- 8; 52:6). Further, miracles also attested the truth of God's teachings. Without thinking that he was challenging God's authority, Elijah boldly proclaimed that the God who produced fire was the one, true God (1 Kings 18:20-45). Jesus used His miracles to answer John the Baptist's doubts (Lk. 7:18-23) and proposed that His resurrection would be the chief sign of His identity (Matt. 12:38-40; 16:1-4). Peter (Acts 2:22-24; 1 Pet. 1:3-4) and Paul (Acts 17:31) both agreed that Jesus' resurrection confirmed His teachings. We will not lengthen this discussion of evidences and Scripture. We have only looked very briefly at two areas--a few resurrection passages and some texts that instruct believers and unbelievers to test and examine God's revelation. I have argued, at least regarding the first, that Bahnsen has revealed a selective choosing of Scripture texts in order to argue his presuppositional case against Montgomery. Here, too, Bahnsen has failed to establish that case. Evidentialists may not always argue properly, but the fact that they utilize an evidential basis to argue for the truth of Christianity is far from condemning. This is especially so when, on several occasions, Jesus presented His resurrected body to assuage doubt and to cause faith, and God, the Author of Scripture, challenges us to check out both fulfilled prophecy and miracles in order to determine the truth of His revelation. Regarding Greg Bahnsen's critique of John Warwick Montgomery's apologetic methodology, I have primarily responded to charges involving three major pillars in Montgomery's works: his "positivism," probabilism, and his chief argument for Christian theism. Then I addressed two major concerns regarding presuppositionalist apologetic systems of the Van Tillian variety, both of which are seen in Bahnsen's critique. These concern why detailed historical (or other inductive) arguments are so seldom forthcoming from the chief proponents of this variety of presuppositionalism, even though they are deemed to be crucially important, and various examples in Scripture of what I will simply call evidential-like statements. The latter also involved Bahnsen's challenges to Montgomery. I now conclude that it is possible to both defend an evidentialist methodology against Bahnsen's complaints, as well as pose some serious objections to his variety of Van Tillian presuppositionalism on its own ground. Those who wish to study how related issues were dealt with throughout the Christian era, including both similar and dissimilar responses by Christian scholars, could consult works such as the following: L. Russ Bush, Ed., Classic Readings in Apologetics: A.D. 100- 1800 (Grand Rapids: Zondervan, 1983); Avery Dulles, A History of Apologetics (New York: Corpus Instrumentum; Philadelphia: Westminster, 1971); John K.S. Reid, Christian Apologetics (London: Hodder and Stoughton, 1969); Bernard Ramm, Varieties of Christian Apologetics (Grand Rapids: Baker, 1979). Twentieth century concerns are treated in Gordon R. Lewis, Testing Christianity's Truth Claims (Chicago: Moody, 1976). This is amply illustrated by the recently released volume Five Views on Apologetics, Ed. Steven B. Cowan (Grand Rapids: Zondervan, 2000). The presuppositionalist position is argued by John M. Frame while the evidentialist position is defended by Gary R. Habermas. William Lane Craig and Paul D. Feinberg take views that are closer to evidentialism while Kelly James Clark holds a Reformed position that shares some aspects (but not others) with the presuppositionalist view. As editor Cowan remarks, however, one of the striking features of this volume is not only the important areas of agreement between the contributors (pp. 375-376), but even the converging nature of their positions (pp. 380- 381). Greg Bahnsen, "A Critique of the Evidentialist Apologetic Method of John Warwick Montgomery," (1974) Covenant Media Foundation, (870) 775-1170, published at www.cmfnow.com. As found in Montgomery's volumes The Shape of the Past: A Christian Response to Secular Philosophies of History (Minneapolis: Bethany, 1975), pp. 138-145; Where is History Going? Essays in Support of the Historical Truth of the Christian Revelation (Grand Rapids: Zondervan, 1969), pp. 31-36. Bahnsen lists the steps on page 11. John Warwick Montgomery, "The Theologian's Craft," in The Suicide of Christian Theology (Minneapolis: Bethany, 1970), p. 278. See Ernst Breisach, Historiography: Ancient, Medical, and Modern Second Ed. (Chicago: University of Chicago, 1994), p. 408; C. Behan McCullagh, Justifying Historical Descriptions (Cambridge: Cambridge University, 1984). Although older, Christopher Blake offers some fruitful commentary in the essay "Can History be Objective?" in Theories of History, Ed. Patrick Gardiner (New York: Macmillan, 1959), pp. 331-333. I treat some of these issues in detail in "Philosophy of History, Historical Relativism, and History as Evidence," in Evangelical Apologetics, Ed. Michael Bauman, David Hall and Robert Newman (Camp Hill, PA: Christian Publications, Inc., 1996) and Appendix 1, "Historiography," in The Historical Jesus: Ancient Evidence for the Life of Christ (Joplin: College Press, 1996). Gary Habermas, "Evidentialism" in Cowan, pp. 94-95. See Bahnsen's comments on the affects of sin (p. 3) and one's presuppositions (p. 10) on our historiography. In the first reference, however, he is still not pleased with Montgomery's position. Even a brief listing of relevant responses, both pro and con, would be lengthy. Some examples are as follows: Ronald VanderMolen, "The Christian Historian: Apologist or Seeker? "Fides et Historia, Vol. III, No. 1 (Fall, 1970); Ronald H. Nash, "The Use and Abuse of History in Christian Apologetics," Christian Scholar's Review, Vol. I, No. 3 (Spring, 1971), pp. 217-226; Ronald VanderMolen, "`Where is History Going' and Historical Scholarship: A Response," Fides et Historia, Vol. V, Nos. 1-2 (Spring, 1973), pp. 109-112; Earl William Kennedy, "John Warwick Montgomery and the Objectivist Apologetics Movement," Fides et Historia, Vol. V, Nos. 1-2 (Spring, 1973), pp. 117-121. But Montgomery was not without his own supporters: Paul D. Feinberg, "History: Public or Private? A Defense of John Warwick Montgomery's Philosophy of History," Christian Scholar's Review, Vol. I, No. 4 (Summer, 1971), pp. 325-331; Steven A. Hein, "The Christian Historian: Apologist or Seeker?--A Reply to Ronald J. VanderMolen," Fides et Historia, Vol. IV, No. 2 (Spring, 1972), pp. 85-93. Of course, many other apologists have also made similar claims, even from theological positions closer to Bahnsen's. Some examples prior to the discussions between Montgomery and Van Til include Edward John Carnell, An Introduction to Christian Apologetics (Grand Rapids: Eerdmans, 1948), pp. 113-115 and James Oliver Buswell, A Systematic Theology of the Christian Religion, Two vols. (Grand Rapids: Zondervan, 1962), vol. I, pp. 72-101. As Carl F.H. Henry states during a dialogue in Montgomery's History and Christianity, p. 105. For a detailed explanation, see Gary R. Habermas, "The Personal Testimony of the Holy Spirit to the Believer and Christian Apologetics" in Journal of Christian Apologetics, Vol. I, No. 1 (Summer, 1997), pp. 49-64. Although Van Tillian presuppositionalist Frame offers some qualifications, he agrees with several of the chief features of Craig's distinction between knowing and showing the truth of Christianity (p. 78). Probably the longest passage is found in Montgomery's Shape of the Past, where the entire treatment occupies a total of about seven pages. Of that, the outlined argument itself only takes about one page (138-139), followed by about five pages of answers to some objections (140-145). In Where is History Going?, the whole argument is stated in just over one page (35-36). Of course, Montgomery returns to various points, especially the reliability and/or the inspiration of Scripture, throughout his writings. See Frame's statements in Cowan, pp. 228-230, 132-135, 358. For other instances, see Frame's volumes The Doctrine of the Knowledge of God (Phillipsburg: Presbyterian and Reformed, 1987), pp. 353-354, 379 and Apologetics to the Glory of God: An Introduction (Phillipsburg: Presbyterian and Reformed, 1994), pp. 60, 71, 85-86, 145-147. One example where Bahnsen argues defensively against Islam is found on pages 7-8. For some of Frame's cautions concerning positive arguments by evidentialists, see Frame in Cowan, pages 132-137, 357-363. George Mavrodes, "Jerusalem and Athens," in Faith and Rationality: Reason and Belief in God, Ed. Alvin Plantinga and Nicholas Wolterstorff (Notre Dame: University of Notre Dame, 1983), pp. 197-198. Again, I am speaking specifically of the Van Tillian variety of presuppositionalism here. Ronald Nash, being much more influenced by Gordon Clark (who himself had grave differences with Van Til! ), is a very different sort of presuppositionalist. Among his many volumes, Nash has written an apologetics text, entitled Faith and Reason: Searching for a Rational Faith (Grand Rapids: Zondervan, 1988). Even Nash spends significantly more time on philosophical issues than historical ones, yet as I remarked in a review of this book, he helps to answer the question we are addressing here--why at least some presuppositionalists do not write more books on evidences (Gary R. Habermas, "A Reasonable Faith," Christianity Today, June 16, 1989). A presuppositionalist often responds that it is the evidentialist's philosophical and theological foundations that they most object to--areas such as one's starting point, view of man, the noetic affects of sin, even the theological system being used, and so on. But my point is different from this. However we start, how will the presuppositionalist deal with specific refutations of specific factual charges against the historicity of the resurrection, if not similarly to the evidentialist? Once again, the presuppositionalist must do more than assert an answer, too. She must work out the factual data, line by line! Bahnsen states that "God's word is self-attestingly authoritative" (p. 9), but with little or no elaboration. But such a pregnant proclamation simply begs for some examination, both by him as well as by others. Is this said to the believer only? Or is this meant as a proclamation to the unbeliever? Does this describe Bahnsen's apologetic approach, or does he propose at least a few positive evidences for the truthfulness of Christianity? If so, how will he set them forth, given that he seems to have stripped apologetics of its usual tools of the trade? He needs to explain in detail how this is going to help us establish Christianity by anything other than a proclamation. Beating us over the head with a comment something to the effect that if natural man will not accept this proclamation then none other will be forthcoming not only falls prey to the above discussion about the lack of a positive apologetic, but also tends to show further that an unwarranted skepticism is present. I will return in the next section to the issue of whether Bahnsen's is the approach set forth in Scripture, as he declares. But I am getting too far ahead of myself here. I will simply once again register my desire to have a straightforward answer to the question of whether positive apologetic arguments are possible, as well as a few details on how this would look in a Van Tillian framework. In the meantime, I will refer the reader to a more detailed discussion of circularity in the writings of Frame, who spells out the sense in which he makes what appears to be a related comment: "The Bible is the Word of God because it says so." (See Frame's Apologetics to the Glory of God, p. 14; cf. p. 136 and the discussion in these contexts.) For my critiques of what I think is a viciously circular argument, see Habermas in Cowan, pp. 241-248, 343- 344. Frame responds kindly in the same volume, pp. 354-359, where he also makes some very interesting concessions, i.e. that his statement above "is not an apologetic argument in a serious sense" (p. 356), that presuppositionalism has failed to offer positive arguments for Christianity (p. 357), and that it may not be a complete apologetic system (p. 357). It is unclear whether or not Bahnsen would have agreed with his colleague Frame. But I think these problems are crucially serious objections to the Van Tillian apologetic method. Readers can make their own judgments after reading the dialogue between Frame and myself. Incidentally, that even a few philosophers became Christians after hearing Paul speak, using Jesus' resurrection as the chief evidence of his theistic claims (Acts 17:31), is one of many examples where straightforward presentations of the evidence led to conversions (see below, too). This is not an informal fallacy of the ad hominem tu quoque variety, since I am not charging Bahnsen with failure to abide by his own challenge. Rather, I am simply arguing by analogy in pointing out that the observation he makes about Montgomery is not true of any apologist, including Jesus or Paul, and thus fails to count against Montgomery's position. Intriguingly, we are even told that debating and presenting the resurrection was Paul's most frequent approach, and again people believed (Acts 17:2-4). I wish to note here clearly that whenever persons come to the Lord through apologetics or any other method, such was the result of the Holy Spirit's power, not the overpowering nature of the historical evidences, human preaching, or witnessing.